I really enjoyed decorating the chipboard pieces on this layout. I love creating magical gardens around my photos and this is what I did for this layout of my daughter walking in the tall marsh. All the 2 Crafty chipboard pieces like the Ornate Screen above, were treated the same way using different 13 Arts Mediums. First they were Primed in 13 Arts Gesso. Then they were sprayed in a mixture of 13 Arts Sprays: Pearl Yellow and Pearl Olive green. Once the ink was dry, I applied 13 Arts Gel medium to the edges of the Thistle Shrub and the dandelions . Then I threw some 13 Arts Glass Filler Micro Glass beads on top of the gel medium and let it dry. I really love how the shrubs came out. The micro-beads gave the shrubs a 3D look. This gorgeous 13 Arts large white flower was used to anchor my layout. 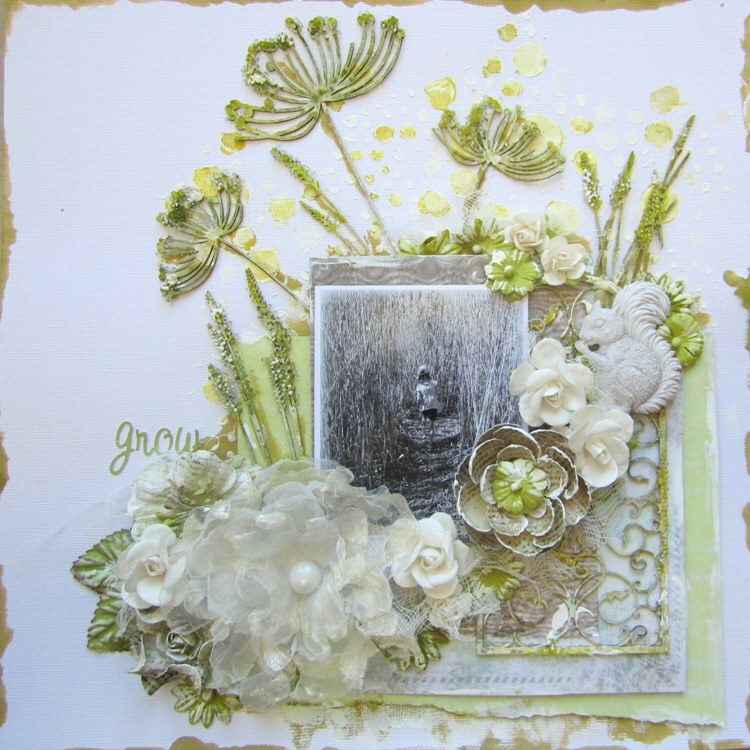 Then I used lots of other flowers to embellish around the photo. I hope you enjoyed my creations as much as I loved making them. Soooooooo amazingly gorgeous! I loveeeeeeeeee the colors and the flowers!!! Just jaw dropping gorgeous. Such a beautiful nature scene you have created here – one can hear the fairies sing. Absolutely outstanding… I've only just got my internet back, and I'm so glad I didn't miss this one – it may well be my favourite of yours ever. The greens are so pretty and fresh, and the glass beads on the meadow grasses are simply genius! A beautiful piece of art, Keren – I love it! This layout is just mind blowing. I love everything about it… those chippies are just wonderful and I love your treatment of them… I need to try this..